I’ve seen SaaS and productized service companies operate with anywhere from net-negative revenue churn to 45% monthly customer churn. In this post, I’ll share some underlying causes of churn and practical tips you can use to reduce churn. Let’s say you run a productized service for podcasters. You deliver transcribed show notes, edit the podcast audio and share the episode. Right now, your scope is a small chunk of the overall business process. You’re easily replaceable. If a competitor comes along with a product that does the work cheaper or better, you’re in trouble. To address this, you can look upstream and downstream from your product scope to find more opportunities in their business process. This makes you a more valuable provider because there’s more at stake if the relationship ends. Put bluntly, if you can figure out a way to become part of the plumbing of your customers business, it’s really painful and annoying to rip and replace. I’ll share a great example of a plumbing product a bit later in this post. This will help you come up with new problems you can solve and ways to expand your plan offerings. This diagram attempts to explain how this approach could work for a productized podcast service that wants to go upstream and downstream. If you truly can’t expand your product offering, then you can turn your attention towards marketing. Focus on how to acquire customers as cheaply as possible. Apply the same upstream and downstream view to a customer who finds your product and experiment with different ways to amplify the efficacy of your funnel. In practice, you might build a content flywheel, nail a paid ads strategy or create a simple viral loop in your product. The working assumption with this approach is that your contract length is fixed and you’re trying to address the other side of the equation. Once you’ve completely nailed acquisition, you can start to create efficiency in your business operations. And then you go back to improving your product. A zombie is a customer who pays you, but derives no value from your product or has forgotten you’re charging them. Products like TrueBill have created very successful products by stamping this problem out. The first time I heard the zombie term at a WeWork lunch and learn, I flipped out. It hit home. Apart from the ethical problem with charging people who aren’t receiving any value in return, you’re also building an extremely brittle business. Let’s get dramatic for a second. Imagine that your payment gateway fails, and you need to go through your customer base and resubscribe every customer, one by one (this happens, by the way). If you’re heavily skewed towards a zombie base, then you’re in big trouble because a lot of your customers will leave you behind. So, how do you prevent your customers from becoming zombies? Education: share a resource that helps your customer become more successful with their business. This resource may or may not involve your product. Product update: focus on how a customer can get the most benefit from your new feature, rather than what it does. Up-sell / cross-sell: respectfully and thoughtfully offer upgrades by either plan type (standard to premium) or contract length (monthly to annual). Milestone: celebrate your customer’s loyalty and if your profit margin supports it, reciprocate with a gift or bonus. When you thoughtfully combine this with social sharing, you can create a nice little referral loop. Here’s a free swipe file you can download that provides examples of each type of contact. An off-menu or hidden downgrade option is a product tier you hide from your public plans page and only make available to customers who are at risk of churning. This strategy gives you a method to increase your customer’s lifetime value, improve your NPS and maybe even drive a few more referrals too. Your success will depend on the market you’re in, how portable your product is and a number of other attributes. Let’s do a brief case study on a product called Fancyhands. They provide a virtual assistant service where you pay a monthly subscription fee for tasks. The subscription fee buys you a specific number of task credits; $79 gets you five credits, $99 gets you seven credits and so on. The credits roll over from month to month, so if you pay for ten and don’t use them all, the remaining balance goes into your account. If you decide to cancel, you lose all of the credits. The credits cannot be refunded, redeemed for any cash value or transferred to another provider. I discovered I could keep my account open for an 80% discount to my subscription price and continue to use the remaining credits. Downgrading to this option put my subscription in maintenance mode; so I wouldn’t gain or lose any credits, but I would still have access to use the ~$700 I had already paid. If I canceled, I would lose the ability to use the credits but more importantly, feel like I was getting the raw end of the deal. The successful transition to the downgraded plan became the subtle difference between me telling my friends “Fancyhands was OK but I didn’t see long term value in it” to “Fancyhands is awesome, I’ve been a customer for three years and love the service!” It’s difficult to put a dollar value on what that means to your customer base, but you can roughly approximate a dollar value on what retaining the customer will mean to your business. How? 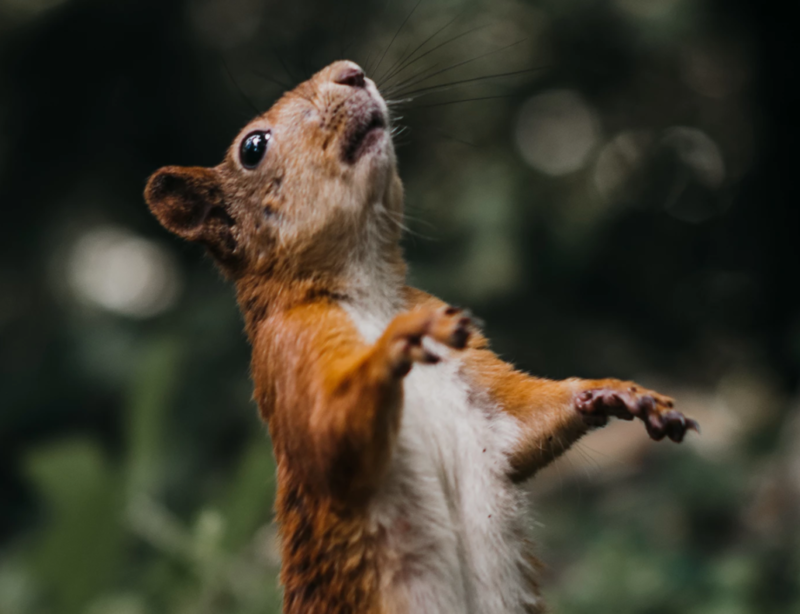 For simplicity’s sake, we’ll assume that a canceled customer will never return and because you have excellent unit economics, an additional customer retained on a lower value plan will not become a financial drag on your overall business. Here’s a downloadable spreadsheet [update link] you can copy and paste to help you visualize how this scenario will work for your business. For a single customer, the numbers aren’t amazing. Initially, you will see a small lift in lifetime value, Average Revenue Per User (ARPU), subscription length and maybe a referral. But when you take these numbers and model them over the entire customer base over an extended period of time, then the downgrade option becomes even more interesting. When you increase your customer’s subscription length, you get more opportunity to sell them back up into their original plan, through education. An active customer is also much more likely to refer a new customer to you, too. I’ve created an editable worksheet that you can copy and implement for your own business, here. Is there a way your product retains value? How transferable or portable is your product? For example, can a customer export their data from your product and leave without any friction? Or is your product very sticky and hard to unplug from? Can you offer a significant discount (50-80%) to a given plan type but remain profitable? What are your unit economics per customer? For example, can you serve an additional low occupancy customer with marginal cost? What is driving the request for cancelation? Is it a lack of usage (this makes it easier to transition to a lower-level plan) or is it dissatisfaction? If you’ve made a customer unhappy then desperately throw a discount their way, you might damage any goodwill you have left. Answering these questions will not only help you figure out whether your product is ready for an off the menu downgrade option, it will also help you figure out what you need to put in place to get there. Imagine you buy a piece of Ikea furniture, you get home to assemble it and there is no instruction manual to tell you where the pieces go. The same effect happens when you buy a product that sends you a long email packed with confusing instructions, fire up an app that has no onboarding steps or pays for a product that lacks an intuitive UX that helps you move through the experience. Do you help lock into their business process by connecting with other apps? I use a transcription service called otter.ai and it runs off the back of my Zoom account. I’ve had to look for the integration a few times, when it is the key driver of my usage. Do you walk the customer through a demo of how to successfully achieve value immediately? Better yet, do you guide them through their first experience in a light-touch way to achieve value? This might be setting up a templated task, creating something on their behalf or removing friction so they can move forward. Do you celebrate when the first milestone is reached, either in-app or via another channel? Do you provide them with specific next steps on what to expect as they continue to use the app? Do you kick off a usage loop, so the customer’s action kicks off an event where they will need to get back into the app within a specific window of time? 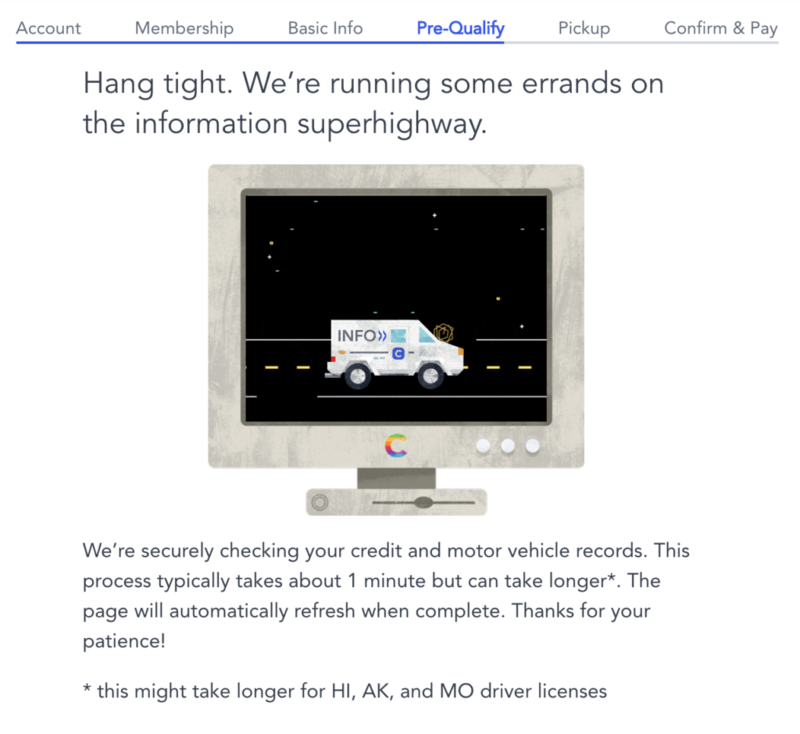 I was excited to try out a car subscription service called Canvas. The value proposition was compelling, it delivered a significant saving over a long-term rental car, and I love being an early adopter for ‘anything-as-a-service.’ I worked my way through the onboarding process and submitted a few data points, like name, address and pick up location. Then I was required to submit my driver’s license and social security number. I entered the data and hit the fourth step of the onboarding process, which was a loading screen. It told me not to refresh my browser, and it could take a minute or more to process. I assumed the data would be passed through to a verification service, then either accepted or rejected based on business rules. Fifteen minutes later the loading screen was still spinning, and my emotions soured from excitement to disappointment. I tried a cross-browser test (as suggested by my wife, thanks to technical support Britt), but it was to no avail. I hoped a well-funded startup would have a good customer support experience, so I submitted a ticket and hoped for a speedy resolution. I needed a car the next day, so time was of the essence. While I was waiting, I ran some rough calculations, and I figured my cost of customer acquisition was maybe $50. My lifetime value based was going to be comfortably north of $1,000. If the service was satisfactory, I could easily spend $2-3,000 a year on a service like this. Then, I received this email from customer support. 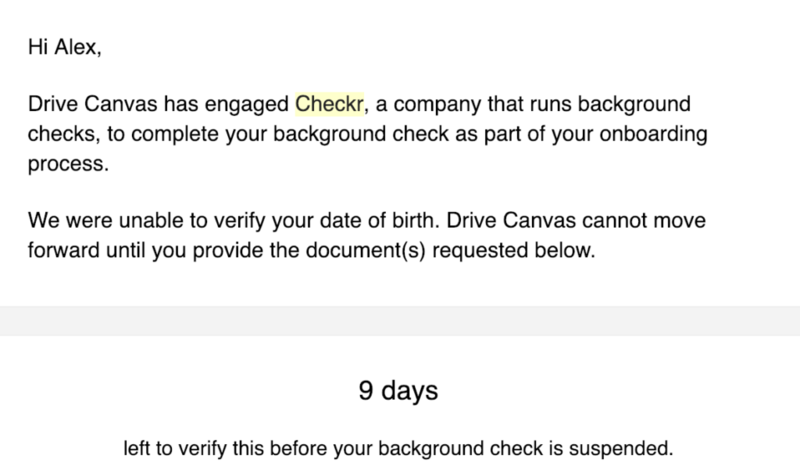 A few hours later I received an email from the ID verification service Checker. The second verification email contradicted the first. Three days later, I still haven’t been verified. The window of opportunity closed, so I took my business to Sixt car rental and they earned $1,600 that could have gone to Canvas ¯\_(ツ)_/¯. Do you ask for your customer’s level of urgency when they sign up? Can you accelerate part of the process if they have a very urgent need? Do your customer support guidelines instruct your team on how to identify potential system issues? Do you proactively manage or present system down status to customers? Can you offer real-time chat or phone support for critical areas of your onboarding? Do you have a back-up sign-on flow if your existing onboarding breaks? Do you solemnly swear to never, ever, ever put your customer in a position where you put them in front of an endless loading screen? Zapier is a product which stitches together different apps, with the result of passing data from a low-level business procedure, like taking data from an email subscription form and copying it into a spreadsheet. When it’s used for a single process, it’s a cool idea but not super compelling or meaningful. However, when there are lots of business apps with lots of data, the appropriate customer can create a latticework of data flows. The incremental time and cost saving from Zapier quickly compounds and the product becomes the glue that holds a bunch of disparate business processes together. In simple terms, once this plumbing is in, you need an excellent reason to rip it out. As a counterpoint to the Zapier example, lots of productized services and SaaS products sit in the realm of being a ‘nice to have’ tool that is forgotten because they overshoot the customer need. A simple Google doc saved in a folder would suffice, even though it had the least bells and whistles. Let’s imagine that I expanded these growth experiments cross-functionally through the company. Then (and only then) would I need a way to track experiment timing, report on outcomes, understand real-time progress and so on. As the business process and the number of parties involved would become more complicated, then I would start to need a more robust and feature-rich product. Below, we’ll try to hone in on understanding the customer and the actual need, instead of getting too excited about a long list of features. Do you have a map of the entire business process that you’re helping a customer solve? What steps of the business process does your product address? Can you solve more steps? How could you bake these steps into your product, creating a dependency? Can you become a system of record for the data? Do you have reporting that shows the derived value on either a time or money basis? What level of expertise does your customer possess? What level of sophistication is the process? Are you matching their needs with your solution or under/over-shooting the mark? Thanks to the Baremetrics public dashboard, you can compare different products against each other on a churn basis. These metrics can you help you see how the level of customer expertise and/or process sophistication can significantly influence churn. When plotted on a 2×2 matrix, the picture becomes a bit clearer. I bought a pass to a Tony Robbins event. My circumstances changed and I was no longer able to attend. Instead of being able to refund the value of the ticket, I was only being able to transfer it to another event. I wasn’t entirely sure when I could commit or where I would be. After a lot of emails back and forward with the team and a failed credit card chargeback, my lifetime value quickly went from ~$5,000 of willing spend to $1,500 of forced spend. The same rule applies to subscription products as well. Customers will come back, but if you’re more focused on short-term revenue than the long-term relationship, they won’t. Let’s take a productized service with an average subscription contract length of 3 months. You could eek out an extra month or two of customer lifespan by offering aggressive discounts for a semi-annual or annual plan, but this can backfire on you in the long term if the customer use stops at month three. Your LTV will improve the expense of customer goodwill and future revenue opportunities. If you see cancellation surveys that say ‘no longer used the service’, ‘don’t need it right now’ or ‘stopped using it’, dig deeper. Yes, it’s possible to be too good at what you do. Take the example of a productized service that provides ongoing leads to a customer. The customer will be satisfied with three new leads per month. The service hits them with ten new leads per week. Good problem to have, right? If you overwhelm your customer, they will churn. If you’re facing these problems, you have a structural issue. Your product is being built on an unstable foundation and it is unlikely you’re going to retain customers past a twelve-month lifespan. It seems obvious, but it happens quite a lot.